Text by Mike Sopko Jr. Photos by Wayne Gierke - Martin Libhart - Mike Sopko Jr. - Mike Sopko Sr. 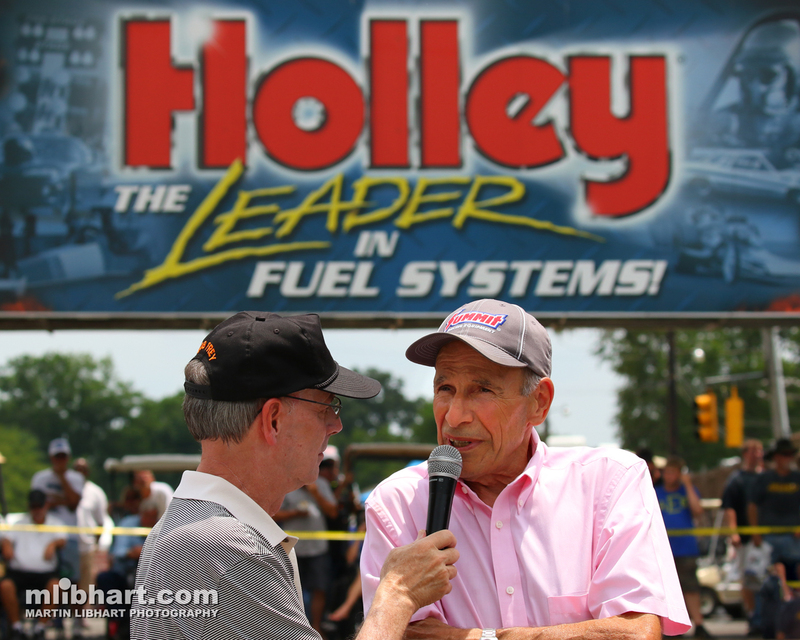 Many nostalgia racers across the nation and especially the Midwest marked Father’s Day weekend on their calendar as their opportunity to come out and run for the title of their class at the prestigious Holley Hot Rod Reunion, held at Beech Bend Raceway in Bowling Green, Kentucky. 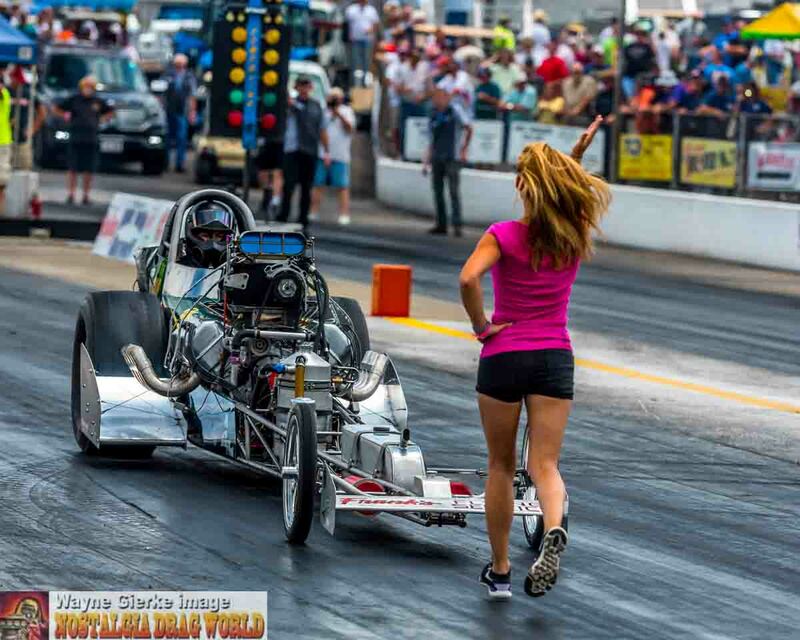 The pits were full of vintage drag racing vehicles and teams hopeful that they would be crossing the stripe victorious on Saturday afternoon right around dusk. Perhaps the biggest hype leading up to this event was the talk of the number of Top Fuel drivers planning on attending the event. Obviously the west coast is the hot bed of nostalgia action especially when it comes to fuel racing. 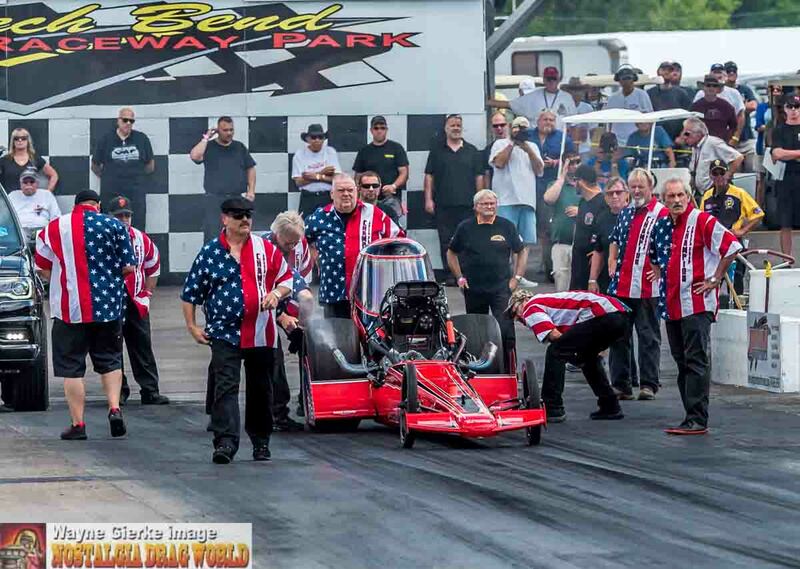 Here at the National Hot Rod Reunion it isn’t uncommon to have a short field for the eight car Top Fuel field, however this year the Internet was a buzz with the number of fuelers planning on arriving. Due to the wide open nature of this year’s points and the fact that there are only four events that determine the points championship several west coast teams came out east to mix it up with teams from the central part of the nation. In all there were twelve teams vying for the quick eight. Teams included the Midwesterners of Tim Cullinan, former March Meet champ Jim Young, Jason Greenwood, Diamond Dave Miller, and Jim and Allison Lee’s grandson Tyler Hilton in the “Great Expectations III” slingshot. Coming out of Oklahoma was Paul Schultz in the “Spirit of Tulsa” fueler. The west coast brought out it’s main stays of Jim Murphy in his “WW2” digger as well as Brendan Murray in perhaps on of the most beautiful front motored dragsters ever. 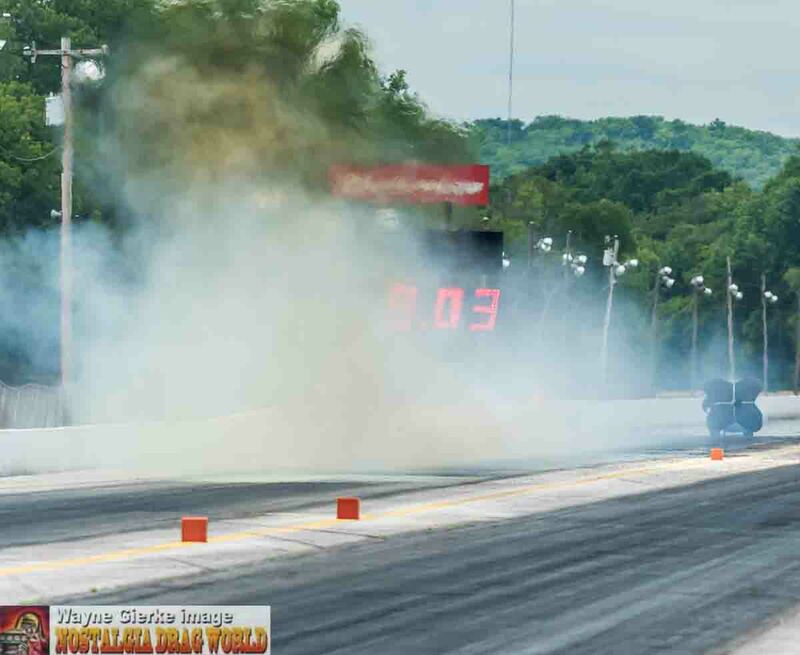 Adam Sorokin was back with his Champion Speed Shop team. New comers this year included Rick White in the “Neal & White” entry and Rick Williamson in the “Team Craig” flamed shorty body dragster. And last, but not least Tony Bartone came out from the East coast in his Boggs tuned McKinney piped entry. 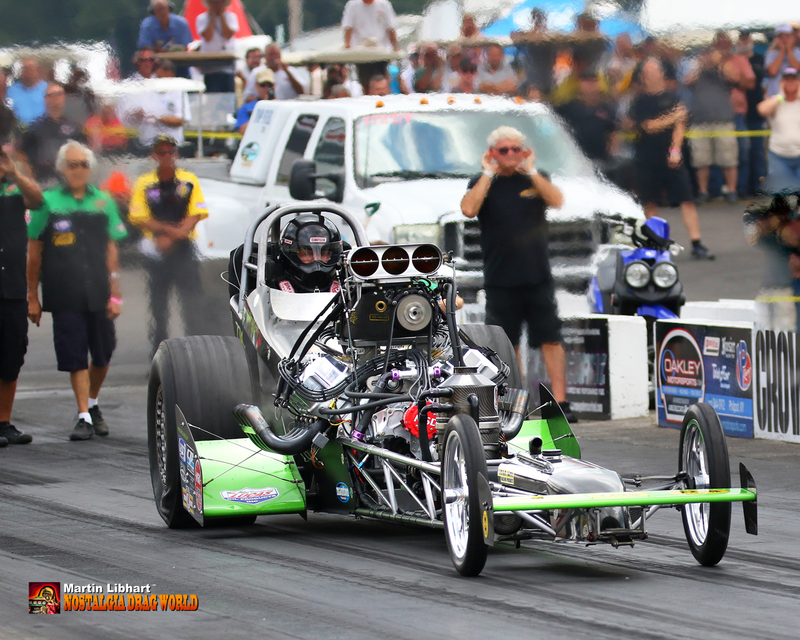 Jim Murphy was the eventual runner-up in the Top Fuel championship pair against Adam Sorokin. Murphy’s tuner, Roland Leong, standing to the right rear of the car. 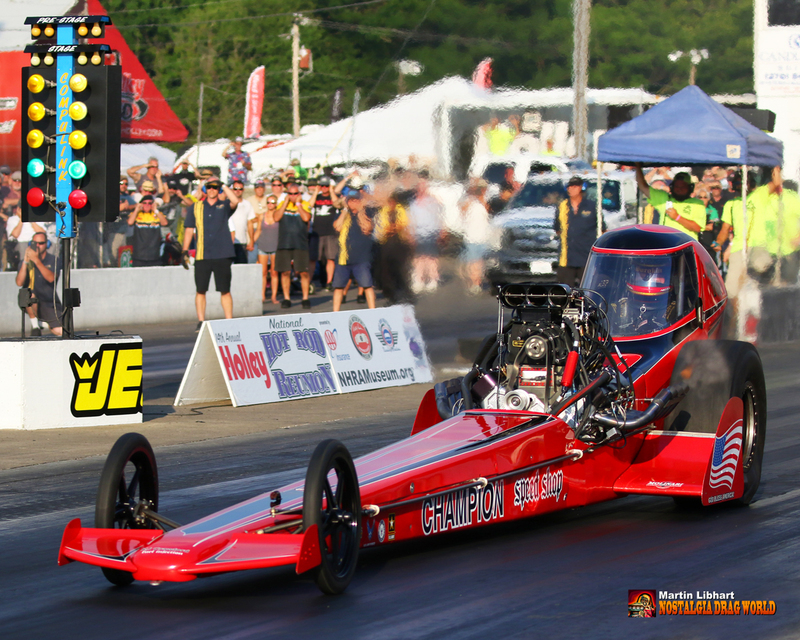 Top Fuel teams were given three opportunities to qualify, one shot on Thursday and two on Friday. Knowing that qualifying for the field was not going to be automatic this year made each round incredibly important. As teams prepared for Thursday’s qualifying effort the city of Bowling Green could have literally changed it’s name to “Boiling Green” as temperatures peaked in the upper 90’s with high humidity that created a heat index well over 100 degrees. I have no idea what the track temp was, but I can only imagine it was well over the 130 degree threshold that often creates very slippery conditions. And based on the performance in the first session the track must have been extremely slippery for the nitro burning slingshots and their narrow rear slicks. Eleven cars attempted to get down the heat wave strewn 1320 as Rick Williamson and crew decided to sit this round out. Only one car was able to make a complete pass and that was Sorokin in his canopied slingshot who made it down the legendary strip in 5.82 at 228 mph. Sorokin was also the only sub-6 second car to this point. Though Friday was warm, temps were much more conducive to quartermile assaults. Also aiding the teams was a much lower humidity that took a great deal of moisture out of the air. Jim Young and Jason Greenwood, both from Wisconsin were the first to test out the new conditions. 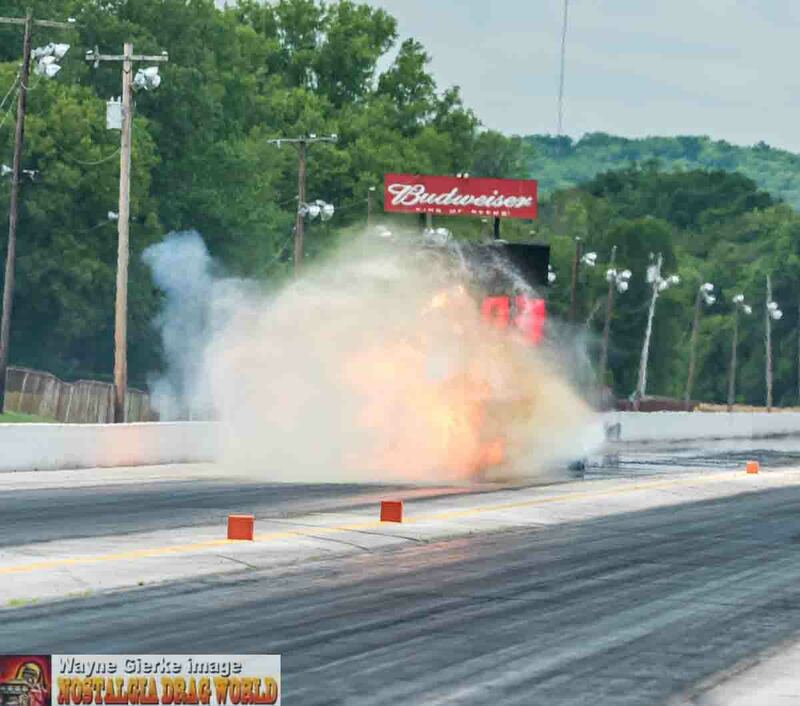 Young carried the torch for the Midwestern teams and took the provisional pole from Sorokin with a 5.66. Though Young might have carried the torch, a literal torch was in the next lane as Jason Greenwood stole Young’s thunder with an enormous fireball at 800 feet. Apparently too much pressure had built up in Greenwood’s entry and the valve cover was split open sending out a shower of oil that ignited producing the large fireball. In talking with Greenwood he was not even aware of the fire until he had seen the pictures as his visor had been covered in oil prior to the explosion. His 6.19 though good enough at the time to qualify him 7th was disallowed for oiling down the track. After a lengthy clean up driver’s put their helmets back on and continued session number 2. By the end of the session five drivers, Rick White, Jim Murphy, Tony Bartone, Jim Young, and Adam Sorokin had dipped into the 5’s. However, Young’s snatching of the pole was short lived as Sorokin bested his 5.66 with his own 5.64. Bartone also joined the 5.6 fray with a 5.68. At this point west coast runner Rick Williamson was still on the outside looking in with a 9.60 and one more shot to go. As the sun began to set at end of the track and shine right into the drivers’ eyes the third and final session began. Greenwood was able to make it for the final session, but was unable to crack the field though it was not for lack of effort. Brendan Murry was unable to return after too much parts attrition and a brief brushing of the wall on the top end in Q2. 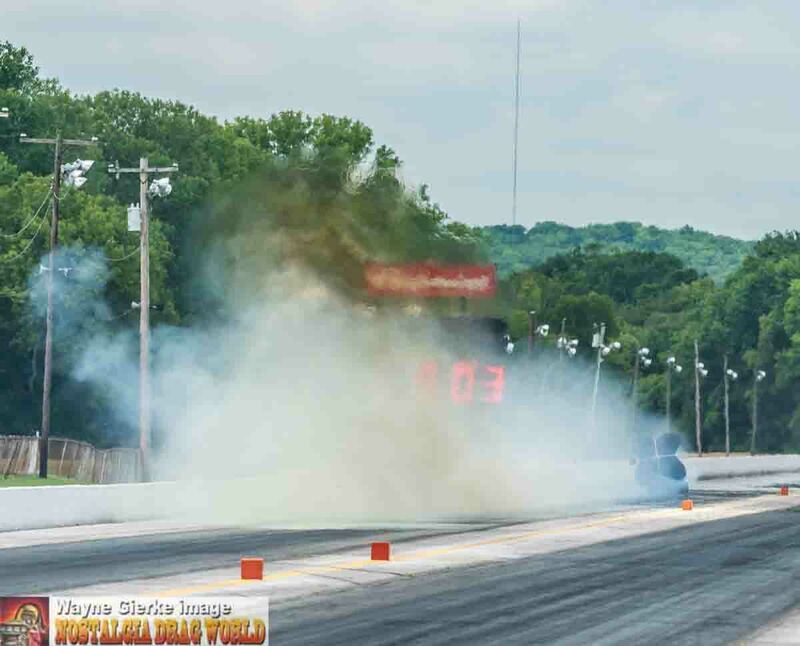 The two big stories of the last session were Rick Williamson’s final attempt and who would carry the number one spot into Saturday’s eliminations. Williamson and Team Craig took the left lane and drove it out the back door with a 5.74 good enough to place him 5th and race the next day. Young sat out the final session and Sorokin was unable to better his time as he had a flash of flame out of the left bank and tossed the belt in the lights. Bartone however, made the best run of the weekend with a stout 5.60 at a mere 237 which tells you there was more there. 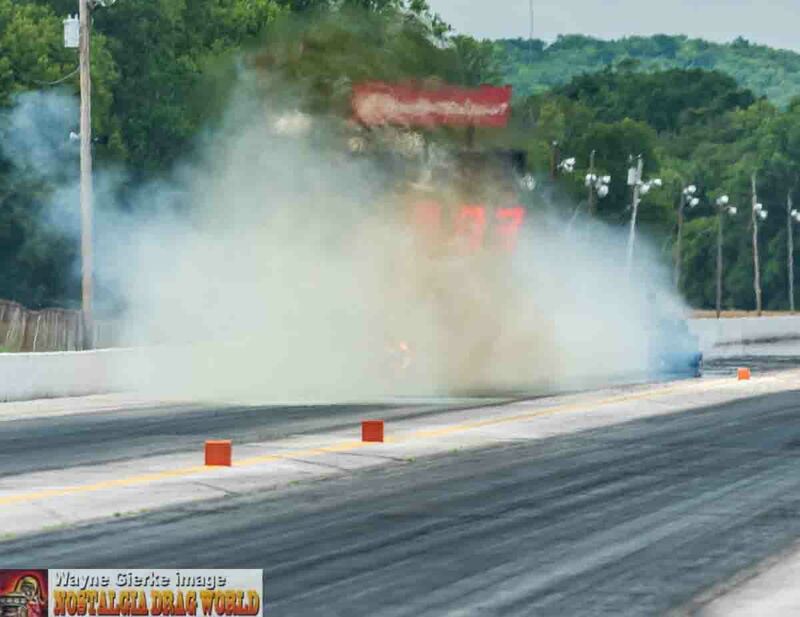 Unfortunately, parts attrition had taken its toll on the fuel teams as nitro has a tendency to do and not all of the qualifiers were able to make the call. Tim Cullinan who sat on the bump was unable to make the call so Bartone was granted a bye run to the second round and he stood on it with a 5.69. 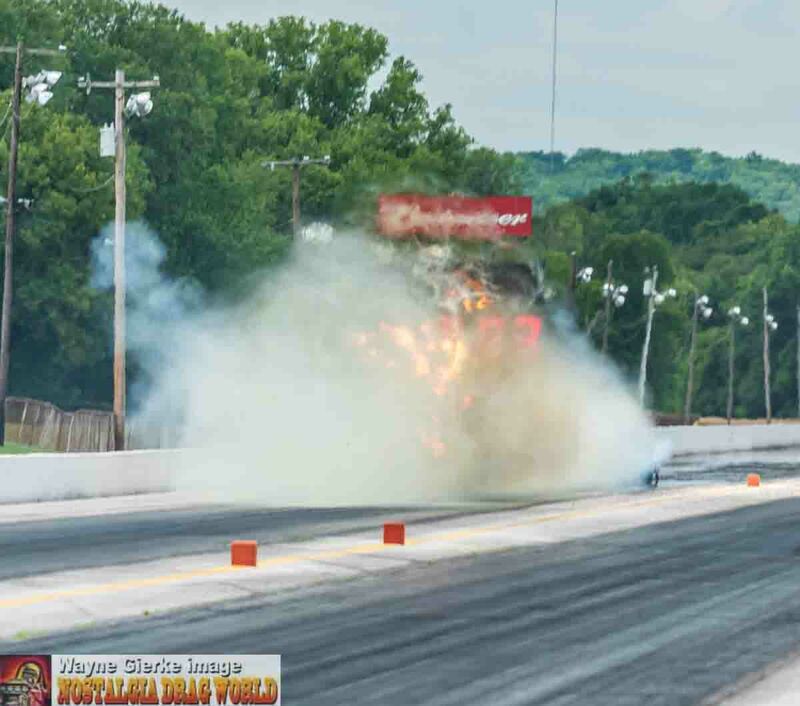 Murry who had qualified 7th also was unable to make the round which allowed alternate Tyler Hilton into the field to do battle with Champion Speed Shops entry of Sorokin. Sorokin was out on him the whole way and took the win by a substantial margin clocking a 5.83. The Midwest’s last hope was Jim Young who was taking on Rick White. The race ended right as the ambers flashed as Young suffered his first career red light and then to add insult to injury had mechanical issues that put oil on the track. White screamed to the finish with a 5.93. The last pair matched Murphy and Williamson. In the best race of the round Murphy narrowly took the win while clocking a 5.74 to Williamson’s 5.81. The semi finals paired Sorokin against White and Bartone and Murphy. Sorokin and White squared off first and this was a barnburner. Both cars moved to the right of their respective lanes with Sorokin hugging the guardrail and White near the centerline. Both engines were fighting to stay lit and together as White clearly damaged some pistons and left a long trail of smoke behind. At the stripe it was Sorokin with a 5.79 to White’s 5.80. Though the next pair should have been equally thrilling the anticipation quickly came to an end as Bartone experienced mechanical trouble and coasted the quarter of a mile while Murphy also sacrificed some pistons to take the win with a 5.68. The final then matched Sorokin in his red canopied liner versus Murphy in his carbon fibered entry. The race looked tight for the first few hundred feet, but then Sorokin’s Chevy again began pulling away from Murphy. Sorokin again came dangerously close to the wall, but kept the car off the cement and took the stripe with a 5.76 to Murphy’s slowing 6.37.